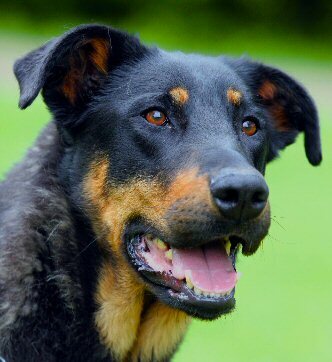 The Berger de Beauce, also called Beauceron or <<Bas Rouge>> (red stocking) is a dog of harmonious proportions, strong, with short coat. Height is about, 65 to 70 cm for males, 61 to 68 cm female. It is a powerful dog with a solid bone structure. Muscles are well developed without being heavy. The head is rather long. Look is franc, expressing liveness and brightness. Natural ears droop. 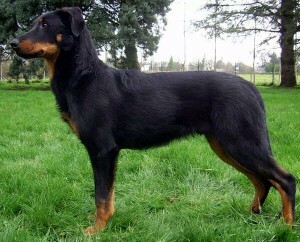 On the inner side of rear legs the Beauceron <<dewclaws>> more or less developed. The tail is long, forming a slight hook in the end. The coat is smooth on the head and legs, short, thick and firm on the body. The most common colour is <<black and tan>>. Tan makes high stockings on legs toning down progressively as going up. 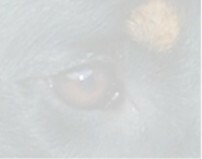 Tan is also present on both sides of muzzle, above brow ridge, on the chest, under the neck and tail. Some black marks called <<charbonnures>> (coal marks) can exist on the legs. 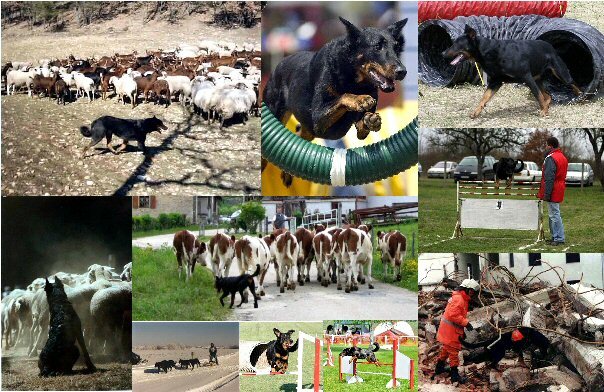 These are the characteristics of the Beauceron or <<red stocking>>. There is a second variety called <<arlequin>>. The coat has black and grey (blue) hair with tan mark. Black and grey in equal parts. In addition to his aptitudes as a guardian or as shepperd dog, the Berger de Beauce is a very clever and polyvalent dog. It is a faithful dog, affectionate (and loving) towards family. The French Club publishes a trismestrial magazine with colour pictures. You can find further information through the topic <<Liens>> on this site which is linked to the clubs in different countries and languages. • Spots over the eyes. • On the sides of the muzzle, diminishing gradually on the cheeks, never attaining under the ear. • On the chest, preferably two spots. • On the legs, disappearing progressively while rising, without covering in any case more than 1/3 of the leg and rising slightly higher on the inside. • Size outside the standard limits. • Eyes too light, or wall eyes (except for harlequins). • Split nose, of a colour other than black, with unpigmented areas. • Overshot or undershot with loss of contact, absence of 3 or more teeth (the first premolars not counting). • Uncropped ears totally upright and rigid. • Rear feet turned excessively to the exterior. • Simple dewclaws or absence of dewclaws on hind legs. • Shortened tail or tail carried over the back. • Coat : Colour and texture other than those defined by the standard. 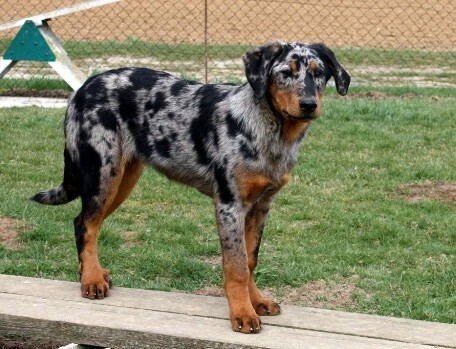 Complete absence of tan markings. Shaggy coat. Well defined, quite visible white spot on chest. For the harlequin variety : too much grey, black on one side and grey on the other, head entirely grey (absence of black).